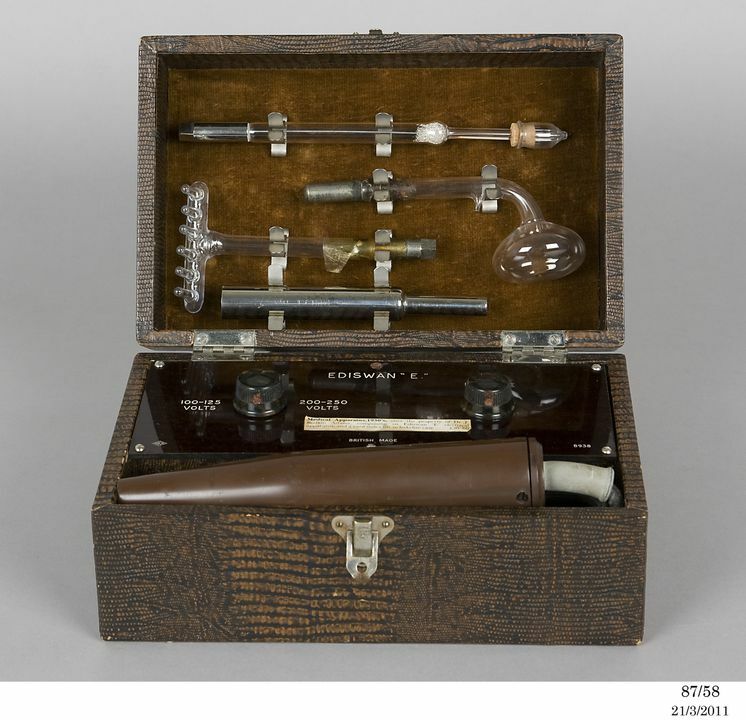 Case containing electrotherapeutic device believed to have belonged to the infamous Dr John Bodkin Adams who was a British general practitioner in the 1900s and had numerous patients die under suspicious circumstances. Made by Ediswan in England, 1930-1940. Rectangular box with [artificial] brown hide covering; brown Bakelite control panel with 2 knobs; 2 cloth covered leads, one for power source input and one one for hand-held massage instrument. Rectangular brown Bakelite box containing index cards with various medical treatments for 'Collosol' brand drugs. This type of device is sometimes called a 'violet ray' generator because of the violet light emanating from the glass electrode when it is switched on, caused by ionisation of gas inside the electrode. Many claims were made by the manufacturers of machines like the 'Electromassage Machine' for their effectiveness in curing all manner of ills. Marked on panel of massage instrument `Ediswan "E"/British made B938'. Handwritten on front: `Dr. J. Bodkin Adams'. There has long been debate over who exactly invented the modern day light bulb. We gave the esteemed Mr. Edison credit for the invention solely because he owned a power company, later known as General Electric, and a light bulb is just a bulb without a source of electricity to light it. In reality, light bulbs used as electric lights existed 50 years prior to Thomas Edison's 1879 patent date in the U.S. In 1860, the English physicist Sir Joseph Wilson Swan was determined to devise a practical, long-lasting electric light. He found that a carbon paper filament worked well, but burned up quickly. In 1878, he demonstrated his new electric lamps in Newcastle, England. Around the same time inventor Thomas Alva Edison (in the USA) experimented with thousands of different filaments to find just the right materials to glow well and be long-lasting. In 1879, Edison discovered that a carbon filament in an oxygen-free bulb glowed but did not burn up for 40 hours. Edison eventually produced a bulb that could glow for over 1500 hours. Swan's initial findings from tinkering with carbon filament electric lighting, and his preliminary designs, appeared in an article published by Scientific American Without a doubt, Edison had access to, and eagerly read this article. Giving Mr. Edison the benefit of the doubt, and stopping short of calling him a plagiarist, we can say that he invented the light bulb by making vast improvements to Swan's published, yet unperfected designs. Swan, however, felt quite differently, as he watched Edison line his pockets with money made from his invention, and took Edison to Court for patent infringement. The British Courts stood by their patent award for the light bulb to Swan, and Edison lost the suit. The British Courts forced Edison, as part of the settlement, to name Swan a partner in his British electric company. Eventually, Edison managed to acquire all of Swans' interest in the newly renamed Edison and Swan United Electric Company. In the year 1883 the Edison & Swan United Electric Light Company Limited (later renamed Ediswan), was formed and became one of the world's largest manufactures of light bulbs. The name: Dr J Bodkin Adams, in printed on the object and this is assumed to be Dr John Bodkin Adams (January 21, 1899 - July 4, 1983) a British general practitioner. More than 40 of Dr Bodkin Adams' patients died under suspicious circumstances, and he was tried and acquitted for the murder of one of these patients. Adams was named in the wills of 132 of his patients. The case of Dr John Bodkin Adams is a contentious one due to the fact that the general practitioner was never actually found guilty of murder or professional negligence. However, years after his own death conflicting views remain about whether Bodkin Adams was guilty of murder or euthanasia. To some he is regarded as a forerunner of the medical mass murderer Dr Harold Shipman, while others believe that he simply carried out mercy killings at a time when painkillers were the only way to alleviate terminal suffering. After the trial Adams resigned from the National Health Service. He was convicted later that same year for forging prescriptions and ordered to pay a fine of £2,200. As a result he was struck off the Medical Register. Adams spent his remaining days in Eastbourne, England, in spite of his tarnished reputation with some still believing that he had murdered at least eight people. Others, notably patients and friends, remained convinced of his innocence. In 1961, he was reinstated as a general practitioner. On July 4th, 1983, Adams died aged eighty-four. At the time of his death, his fortune was £402,970. He had been receiving legacies until his death.